I am writing this fashion post ahead of time because I will be taking a romantic getaway with my husband this weekend. As I am writing, I realize it will be Halloween on Monday! 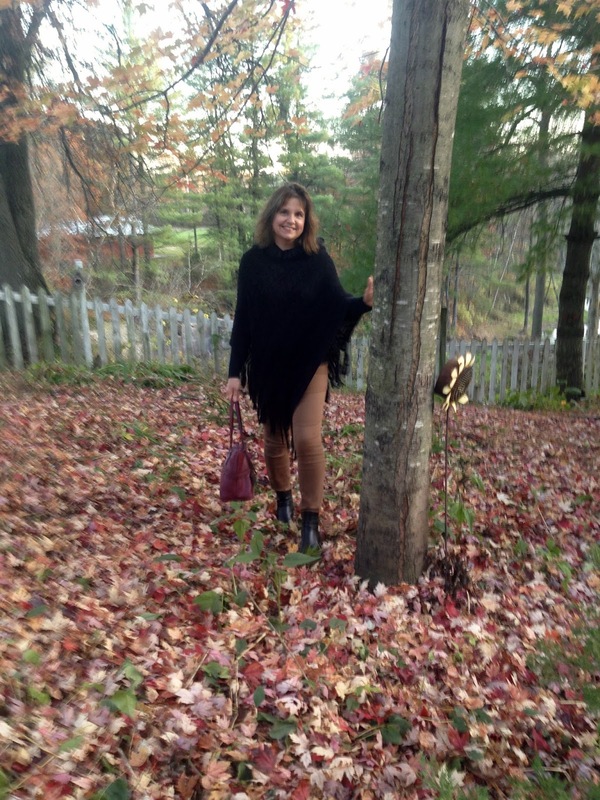 I don't celebrate Halloween anymore so I don't have a costume to show you, but as I look at these pictures I think "Gees, this black poncho would make a great base for a witch's costume!". Too funny. I know. I've been seeing a lot of interesting fashion blog posts where they are showing how you can create a really fun costume by using items straight from your closet and not buying a thing! I love that idea! I bought my poncho last season from a gift shop. I really like it because it's a thin knit and very long. A heavy, short poncho can really add a lot of unwanted pounds. The last time I wore it with a skirt HERE. As I look back on those pictures, I really do not like that outfit at all. But that's the fun part of fashion blogging, you get to see all your hits and misses and learn from them. My brown skinny jeans are new. I received a gift card to Macy's last season from a friend and finally got around to using it. They are by Style & Co and fit beautifully! I never tried this brand before, but I really like it! Since the poncho is see-thru I just wore a black, long sleeve tee shirt from Target underneath. I carried my burgundy bag that your all probably sick of seeing by now, but I always love the pop of color it brings to an otherwise colorless outfit. My ankle booties are from last season. They are by Liz Claiborne. 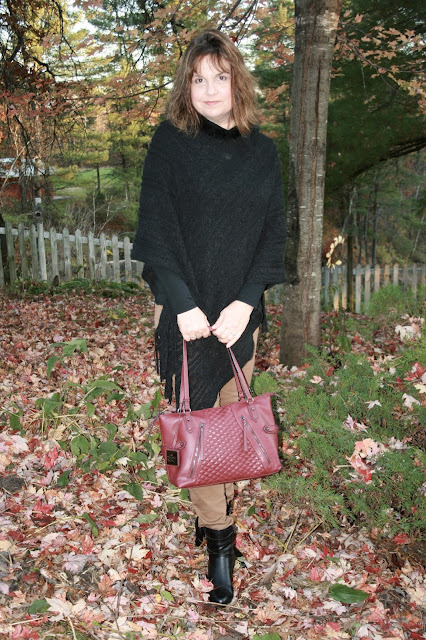 Black Poncho, not available, similar HERE, Style & Co Tummy-Control Colored Wash Straight-Leg Jeans HERE, Black Ankle Boots, not available, similar HERE, Black Long Sleeve T-Shirt, HERE, and Burgundy Nicole Miller Kira Satchel, HERE. I hope you are enjoying your romantic getaway, Amy! 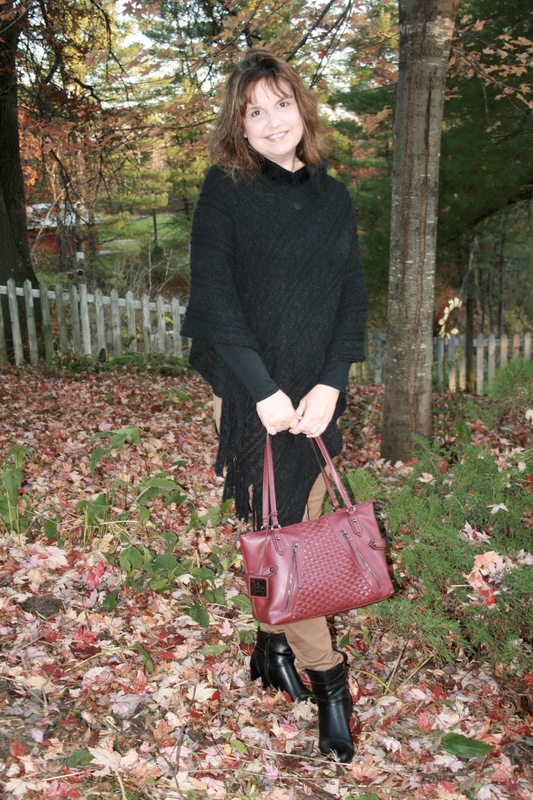 The poncho looks great with the brown pants, and you are right, the bag is a great pop of color! Thanks Andrea! Yes, our weekend getaway was wonderful. We discovered parts of Wisconsin we never knew existed. I even had to ask my husband, "What state are we in? This doesn't even look like Wisconsin". The Coulee Region is so different from the rest of the state. Too funny! I never thought about the fact that I was in the woods too! Another winning outfit! 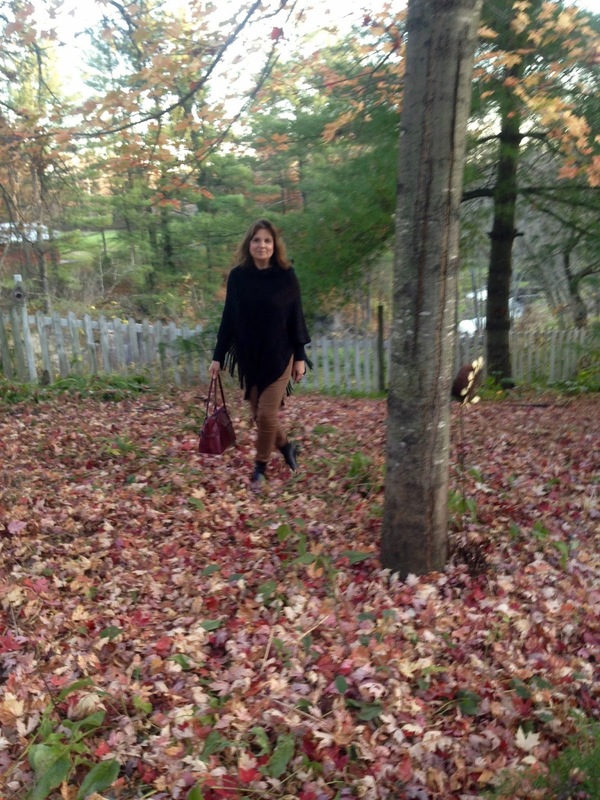 Love how your bag not only pops against your outfit, but looks so pretty with the leaves! I love the "Style & Co" brand at Macy's. I have always found the pieces to be affordable and stylish. Hope you had a great weekend away! Thanks Karen. I will have to check out more options in the Style and Co brand now that I found I like their pants so much! Oh, I love this look, Amy! I have an almost identical poncho, so I may just need to recreate this soon. I hope you have fun on your romantic get-away! Thank you! I'm glad to have inspired you for a change...since I've cased so many of your great looks over the years! So cute - I love how you styled this poncho (a fall must-have for sure!!!)! Thank you! 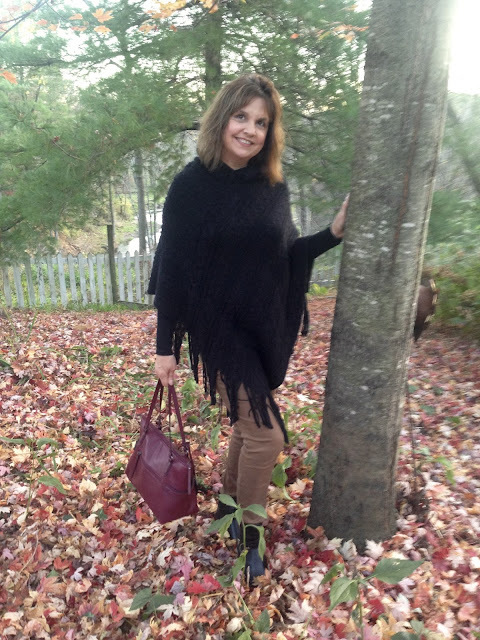 Yes, ponchos are great for fall! That poncho is fabulous! Love the brown and burgundy colors you paired with it! I never had a poncho until just last year---but I've been surprised at how much I love them!! I did like the poncho with the skirt too--I might have tried black tights---but I still like the variety! Love the black & brown in this outfit too---I usually am too focused on color, but the neutrals can be just as fabulous!! Thanks Jodie! I'll have to try the skirt with black tights! I love this poncho so very much! I am a huge poncho fan! Love yours, the fringe detail is great! I love these colors together! Love it! Your poncho is such a great piece! Love how you styled it with the neutrals! Your bag is the perfect pop of fall color! Amy , I love the poncho and the bright burgundy bag with this netural look is a great choice!